Field, BC is one of those towns that I have not had a proper chance to explore in detail. It seems every time I am in the area it is because I am passing through on the way to somewhere else and I just don’t have time to stop to really give the town the treatment it deserves. Seems fitting that it is our first stop on the “Scratch the Surface Tour 2017” or STST2017 as I shall refer to it from here forward. The Friends of Yoho National Park have put together a great walking tour of the townsite. You can find it by following this link and I use it as my reference for the history of the town and the Telegraph Office. 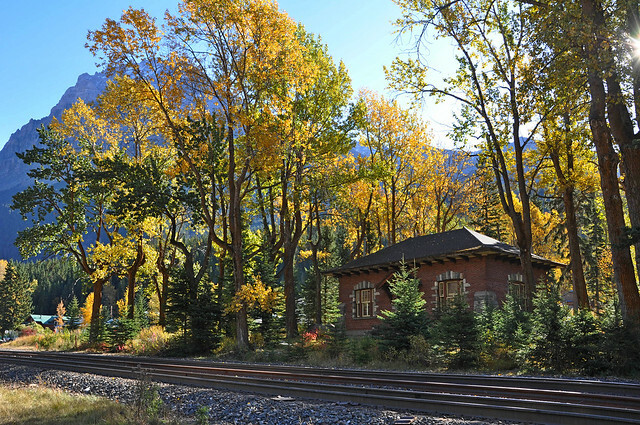 The town was established by the Canadian Pacific Railway in 1883, using the name “Third Siding”. In an effort to raise funds caused the railway to pursue a number of high-profile investors, one of which was Cyrus West Field from Chicago. Apparently Field visited the town and they even named the town after him but he never actually invested any money. Field (the man) was one of the people responsible for the laying of the first trans-Atlantic telegraph cable back in 1858 as one of the founders of the Atlantic Telegraph Company. This makes for a nice tie-in to the main subject of this posting, the Field Telegraph Office, or as the Friend of Yoho refer to it, the CPR Telegraph Building. It was in the late 1990s when I first became aware of this building. It was around 1998 and I remember reading an article listing a small brick building in Field as being for sale and mentioning it was a 1920s telegraph office. Naturally this was all the reason I needed for a field trip to Field. 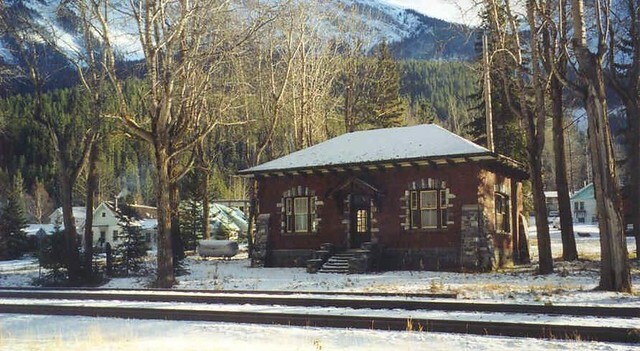 The building was easy enough to locate as it is the first structure you encounter when you cross the bridge into town off the TransCanada Highway. I don’t remember much of that initial trip. I was still shooting photos on film at that time and I was not very good at documenting the details of my journeys. It would be several years later before I would eventually scan the photo and make a digital copy. The photo shows some light snow on the ground so I expect it was taken in late 1997 or early 1998. Fast forward almost two decades and I am once again visiting the building. This is certainly not my first trip back since that initial visit all those years ago; my last trip through was in June of 2014. The small brick telegraph office has become like an old friend that I always stop in and check on when passing by, just to make sure everything is going well. According to the Friends walking tour document, the building dates back to circa 1931 and was used as a telegraph office until 1961 at which time it was updated to become a telephone exchange. The exchange remained in use until 1979. Field has always been a major switching point for the CPR and passengers would gather at the office to send and receive messages during their brief stopover here. On this day, Emily and I had noticed a train coming down the big hill out of the spiral tunnels and we had major hopes of catching a photo of it passing the telegraph office. However, being the junction between the Laggan and Mountain CPR subdivisions (Train geeks can correct me if I am wrong!) means the train stopped short of the townsite and appeared to be preparing for a crew change. We didn’t have the time to wait, so we had to let that photo opportunity pass us by. Not having my original c. 1998 photo with me means I made no attempt to match up the angle of the original photo with the one I took on this day. No matter as it quickly becomes apparent that little has changed with the building in that time. It looks today very much like it did in 1998. One interesting thing to note is that the small trees in front of the building in the 1998 photo have grown much taller and now are several feet high. It seems time keeps moving here, even if the building seems frozen in another era. This entry was posted in History, Travel and tagged British Columbia, Canada, Field, history, telegraph, telegraph office, telephone, trains, vacation, Vacation 2017. Bookmark the permalink. The description of the ” telegraph office ” is mostly not correct. It never was a ” telephone office ” at any time. I closed the office up in 1969 as a repeater office for CBC trans Canada radio networks, in fact being a switching centre for these, carrier systems carrying Canada wide data circuits, teletype, fax, telephone trunks etc and of course telegrams.